The starting point for this work was an analysis of our modern society, which offers a narrative of liberties, dreams and unlimited possibilities but is also informed by constraints and archaic feelings. Taking its inspiration from “The Fall of the Damned”, a baroque painting by Peter Paul Rubens, this photographic work attempts to deliver a contemporary interpretation of the thematic complex of the societal fall. In this represenation, the falling figures have been removed from the baroque-religious meaning of the descent into hell and are now associatively referring to the social structure of our late modern society and to the risk, arising from it, of failing, of losing one’s hold and of falling. The work offers some scope for interpretation, pointing towards the artist’s intention, but at the same time inviting viewers to reflect their own positions. 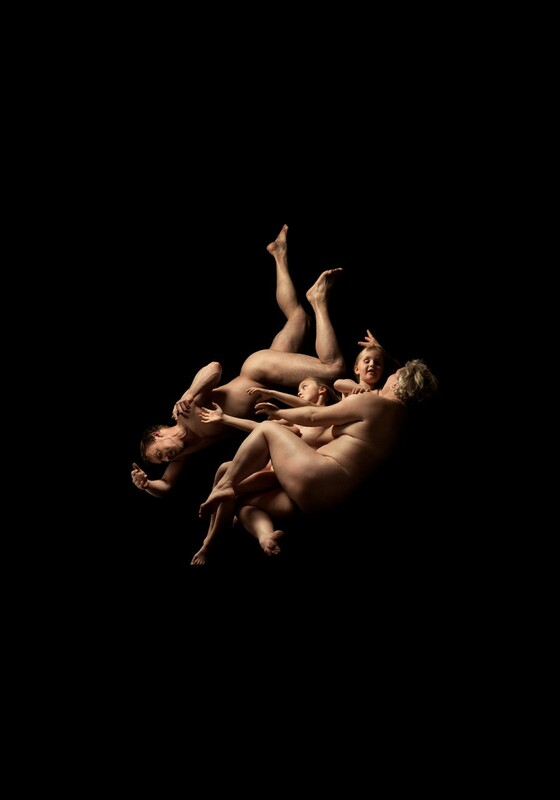 One approach taken by Gertje König in her work is to use historical paintings as semantic and technical templates for photographic conceptions. This digital collage is an example: Viewed from a distance, its tonal hues and its lighting dramaturgy are evocative of a painting, but on closer examination it shows a distinctive richness of detail revealing the photographic medium. The dividing lines between fiction, sensations and the real world get blurred in the interplay of the paintwork-like appearance and photographic “realism”.